I have been using 2x2 binning for all of my photometry images, mainly because of reduced file sizes, and the speed with which I can work with them. I was under the impression that binning was improving my S/N as well. This doesn't appear to be the case. The other day, I took sets of 3 images a star field near the zenith using 2x2 and 1x1 binning, and did photometry for a roughly mag. 14 star. The measuring aperture was doubled for the 1x1 binned images. For the three 2x2 images, the error was 0.025 mag., while the 1x1 images produced a 0.017 mag error. I am curious if others have had this same experience. Is there a simple explanation for the improvement that goes along with not binning? Thanks. I think you need to provide additional information if you'd like us to help you to understand the issue. What is the FWHM of these images (both binned and un-binned)? Are the stars far above the background? What is the readout noise of the chip? Sorry for the slow reply. Here's some specific information for my setup. As you'd expect, 2x2 binning doubles the Max. Pixel and Sky counts. The unexpected result is that 2x2 S/N is significantly worse. I think you should reduce your aperture in case of 2x2 binning as your star will not cover the same pixels as in 1x1 bin. I routinely run my setup in 3x3 binning (due to file size) . I actually have not checked your findngs in my case. polakis: Actually, wouldn't you expect ~ 4 X (not 2 X) the sky and max counts for 2x2 (4 X the pixels) vs no binning, all else being equal? Is 16000 ~ your saturation ADU? If your on-camera binning is additive rather than averaging, that can cause earlier saturation than does no binning. And if the binned image is saturated at star center, we can't trust the statistics. I see that the aperture is in arcseconds, not in pixels. Thanks for the replies. Josch, as Eric noticed, aperture is in arcseconds. 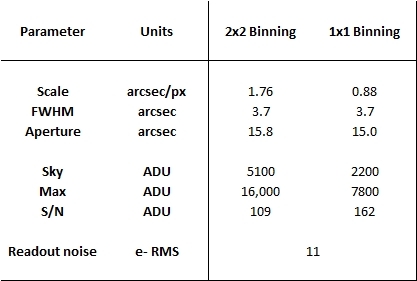 In other words, 9 pixel measuring aperture for 2x2 and 17 pixels (Canopus software needs an odd number here) for 1x1. Eric, yes, I'd expect 4x, but in several tests now, the result has been ~2x. In my linearity tests, the non-linear count for the ST-6303 at 2x2 begins around 45,000 ADU. Perhaps I should see if I get a similar result using a slightly brighter star in that frame. For reasons other than photometry, I am beginning to look into a new computer. If I can be confident that 1x1 is really reducing the errors, I'll go all in for a much faster CPU and greatly increased RAM, and image unbinned. As it stands now, processing and measuring unbinned images really brings my computer to its knees. How do you decide on the size of your measuring aperture? Does Canopus have a SNR curve of growth tool, i.e. a plot showing SNR on the Y axis and measureing aperture pixels on the X axis? I'm using the general guideline of 3 to 4 times the FWHM diameter. My seeing is pretty consistently 3.5 to 4.0 arcseconds, so I use a measuring aperture of 16 arcsec. Oh. *that* Phil! I hope our camera exchange at last year's Symposium worked out for you as well as it did for me! Yes Tom, I'm very happy with our camera trade. If you are going to the SAS meeting next month I'll bring you a picture of what your ST402 is doing now. Back to your binning question. I would be interested to see how much the choice of measuring aperture affects the results you got with binning. If you could adjust the measuring aperture to give the highest SNR for the same star in the binned and unbinned images, that would clear up that part of the question for me. Also, how does Canopus determine the uncertainty? I think that Canopus can do ensemble photometry. Am I right about this? Is that how the uncertainties in your experiment were calculated?